JSC Ukrtransgaz, which supplies natural gas to consumers in Ukraine, as well as transit it through its territory, is working as normal but is ready for the introduction of martial law, the company said on Facebook. 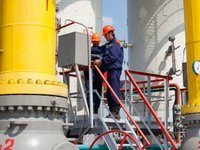 Currently gas supply to consumers in Ukraine is carried out in full and in accordance with the orders. All transit obligations to the EU countries are also fully implemented. Ukrtransgaz also noted the availability of a plan for localization and liquidation of emergency situations and accidents for each of the objects of increased danger. Such plans, which, among other things, were developed for emergencies, determine the appropriate course of action and measures. "In case of martial law introduction in Ukraine, Ukrtransgaz has also developed and approved a mobilization plan and a plan for civil defense of the enterprise. The Ukrtransgaz team is ready to deploy all possible scenarios of further events," the report says.